Long Beach Airport Solar Project with solar electric trackers installed by Suntrek Industries. In 2008, the Long Beach Airport began generating clean and renewable energy by installing six “solar trees.” Each tree is made up of a steel pole topped with a photovoltaic (PV) array approximately 9 feet by 9 feet in dimension. The arrays are bolted to a dual-axis tracker that will guide the array to maximize solar gain by shifting tilt and orientation every hour to track the sun throughout the day. The panels of the solar tree are bi-facial which means that they collect light from above and also reflected light from below, thereby maximizing solar ray exposure. In addition to generating clean energy, the Airport’s “solar forest” will effectively offset nearly a half million pounds of carbon dioxide emissions, the equivalent of planting three acres of trees, over its system life. 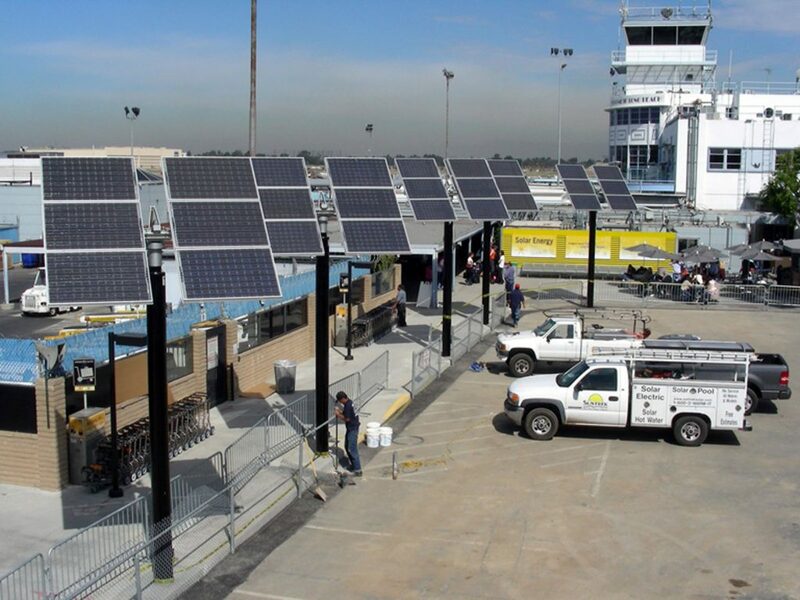 Long Beach Airport Solar Project by Suntrek Industries, featuring solar electric trackers. “This is a great day for Long Beach Airport and a great day for the City of Long Beach,” said Mayor Bob Foster as he welcomed the crowd assembled at the ribbon-cutting of the Long Beach Airport “EcoZone” on March 13, 2008. They were there to see first-hand the state-of-the-art photovoltaic demonstration project, erected at the airport without taxpayer dollars thanks to funding through an innovative public/private partnership. Tom Leary from the City of Long Beach hosted city, airport, and corporate sponsors to the event. He noted that the system was engineered and installed in record time and now stands tall as a statement of Long Beach’s commitment to the environment. A “solar lane,” made up of six “solar trees” flanked by educational signage, distinguishes this key portal to the City. It is located between the busy baggage claim and passenger pick-up. The Long Beach Airport photovoltaic demonstration is one of the most advanced solar systems in Southern California, using a dual-axis tracking system that increases system output by 25 – 40%, and “bi-facial” panels that collect both direct and reflected sunlight. According to Southern California Edison’s California Solar Initiative Administrator, Bob Botkin, the LBA installation is the first dual-axis tracker in Edison’s program. SunTrek Industries of Irvine won a competitive solicitation to install the system. For a firm with over 18 years in the solar business and with over 20,000 solar installations in its portfolio, the Long Beach Airport project was a special challenge. “When we first heard about the location and timeframe, we feared it was impossible. There’s limited availability of these unique panels and trackers. Then you add the complexity of working at a highly secure airport,” said SunTrek CEO Roy Heine. He and his able team overcame structural, electrical, and geotechnical requirements, plus special noise and zoning restrictions, compounded with “owl hour” work (construction from 10 PM – 6 AM), and rain. “Thanks to the special attention paid to this project by City and Airport officials,” noted Heine, “I’m proud to report that our crews delivered the highest quality installation.” At 2:15 p.m., the afternoon before the scheduled press event, the system cleared its final inspection and was given the green light to be energized and interconnected with the Southern California Edison system. During the press event itself, the sun broke through the morning clouds, causing the panels to smoothly calibrate with the morning sun, swinging south and then east to the delight of the crowd and cameras! 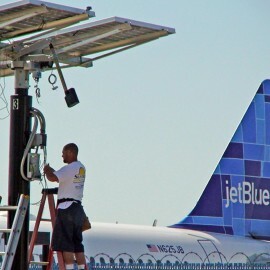 The Long Beach Airport system is made up of six, pole-mounted “solar trees,” each consisting of a 25-foot steel pole sunk 8 feet into the ground — topped with a 9 foot by 9 foot photovoltaic (PV) array. The arrays are bolted to “dual-axis trackers” that guide the array to maximize solar gain, continuously shifting tilt and orientation to track the sun throughout the day. During the winter, when the tilt angle is most extreme, the bottom of the array will be 10 feet from the ground, providing adequate pedestrian clearance. Each “tree-top” consists of six, 186-watt photovoltaic panels manufactured by Sanyo. The panels are bi-facial, meaning that they collect light from above, and then also through light reflected from the pavement below. Their capacity rating is based only direct production. Strings of six panels each feed inverters that convert their direct current output to alternating current, interconnecting with the Southern California Edison grid. EcoMotion is an environmental and energy consulting firm, located in Irvine, California, that specializes in developing cutting-edge solar programs and projects. For EcoMedia, an environmental marketing firm in New York City, EcoMotion provides demonstration project management. In two weeks, a combined lighting and solar demonstration at historic Miami City Hall will be presented to the City.